Reviews | Regal Cajun Spice & Skillet Seasoning - 5 lb. 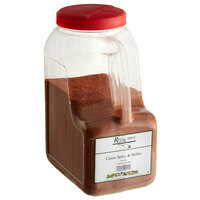 Regal Cajun Spice & Skillet Seasoning - 5 lb. Bring a hint of zesty New Orleans flavor to your entrees with Regal Cajun spice and skillet seasoning! It features a savory combination of paprika, onion, garlic, pepper, spices and salt. Popular in Louisiana cuisine, Cajun or Creole spices are known for their robust flavor. This Cajun spice and skillet seasoning will add a little heat to your menu and can be used as a coating on meats to achieve a "blackened" effect. I use this seasoning to make southern style boiled peanuts. I will add 5 lb of raw peanuts and several gallons of water with two CUPS of this Cajun to a 30 quart pot and cook for several hours and you have great hot boiled peanuts. Used on our Cajun Chicken Breakfast plates this Cajun spice seasoning gives our chicken the extra kick that it requires to make it a unmemorable dish. Great product. The quality of this brand is amazing. It's always consistent., the packaging has a great label and the handle works well in a busy kitchen. The flavor is great, its affordable, and love the packaging. I LOVE THIS SEASONING! I use it in my pulled pork spice rub, and for seasoning many Cajun dishes on our menu. It is delicious! We were pleasantly surprised with this seasoning. It was of excellent quality and worked right into our recipes, no different than the more expensive seasoning that we were getting from our vendor. A great shelf stable Cajun spice blend, and always at a low price. Perfectly blended with some flour and this is a hand blacken'd seasoning, a kitchen staple. A little leery because of the low price, but I was very pleased with the quality of the Cajun spice and skillet seasoning. Great flavor and wonderful on our chicken fajitas. Very usable product! Very reasonably priced! Great bang for the buck. We have ordered this product several times and will continue to use this item. Great quality spice blend. The Cajun spice is subtle but bold making it great for our dishes. Great on meats and vegetables for great flavor. I love the freshness of Regal's seasoning blends. They are well packaged and great quality. The Cajun spice and skillet seasoning is great for campfire cooking. The Regal brand of Cajun spice and skillet seasoning is spicy and perfect for our Cajun chicken breasts. The seasoning is bold and has a great spiciness about it. A great purchase. These Regal spices and seasonings are the perfect ingredient wherever Cajun spices are called for. They're not overly salty, and compare at a fraction of the price of the national brands! Great Value, Great Product! I would Highly recommend Regal spices. Quantity verses cost has a great benefit! If you use a Cajun seasoning I would recommend looking into this product and switching over. This Cajun spice is exactly what we needed! Perfect consistency and quality! We use this in a ton of recipes and they're delicious! Great product at a great cost! A really great spice blend that is a great balance of heat. The Cajun spice and skillet seasoning is amazing and is a great purchase to season meat. The Regal Cajun Spice is so fresh and I love using it to spice up any meat dish! Definitely something i will be purchasing again. This is s great universal seasoning blend, not full of salt like so many others! Compare this to the very expensive blackening magic blend, for a tiny fraction of the price! This is great for those canjun and creole combinations. This is very flavor and smells so great too. This one can be used in so many ways but best for chicken recipes. we are using this spice as main ingredient of our best seller cajun seafood! super savings compare to branded one. webstaurantstore is our main supplier of our ingredients. The 5 pound Regal Cajun spice & skillet seasoning is great. The price is great. I use it in my rubs or when making chili. I use buy all my spices from a food distributor, cost was the same price for a small bottle to 5ibs. Save money on something you need. Spices are right on and make the food taste really good! Good stuff and at a fraction of the price you would pay using your regular purveyors. I order my dried spices anytime I'm ordering equipment so the shipping is next to nothing. This is a quality Cajun seasoning. It is a bit too heavy in paprika in my opinion but I will buy it again and spice itup a bit. Love this Cajun Spice! We use it for anything that we want to add that special heat to. This is the best price that I have found it for! I purchased this product and although I am truly happy with other purchases made on Webstraurant.com., this product seems thin and does not coat our wings as well as our previous product. We first got an 8 oz quantity of the Regal Cajun Spice & Skillet Seasoning and liked the quality so well, on our next order we got the 5 lb size! We use it like crazy. Great flavors! very good quality and very good price. i use to order from local company and their prices are sky rocketing. This also works as blacken seasoning. Good seasoning for the price. I use it for a lot of my dishes. It's cheaper if you buy it in bulk and from this company. I really really enjoy the cajun spice and skillet seasoning. It is not too spicy and has a great smoky flavor. It goes best with seafood dishes. ive used the regal brand spice many times before. but this was the first time using cajun spice, and man what a great flavor, i will buy again. This cajun spice blend is a home run in my book! Adds unique spice to Jambalaya, and gives every dish that authentic southern and cajun flair! From what I have used, this is a nice and high quality product. The 5 pound container is great for storage and it is a great price as well. I really enjoy using this on seafood dishes, for an extra kick. When the descriptions of adding New Orleans taste to your food, its not kidding. It has a kick taste! im sold! I will be purchasing more. Excellent product! We use it when preparing gumbo and it makes a big difference. It is sadds a very nice zest chicken, certain soups, as well as surprisingly eggs!